We spend hours watching shows and movies on our TVs, but why settle for an ugly black screen when your TV is Off? 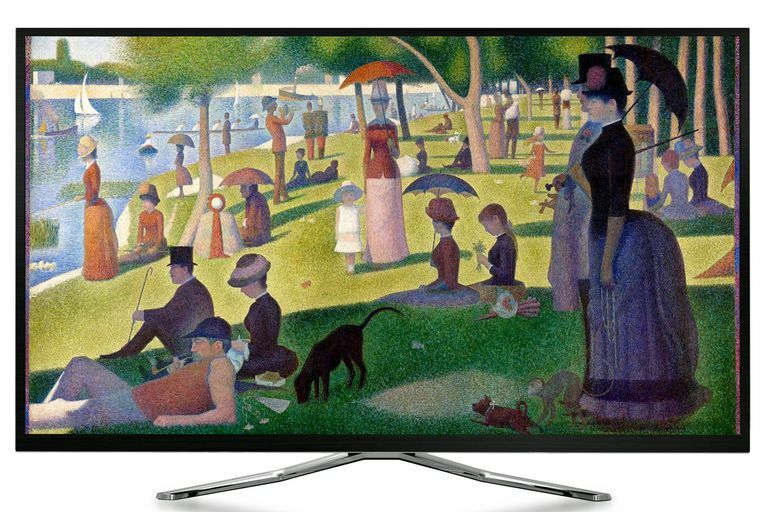 Instead of turning off your TV, leave it on and use it to display classic artwork and more. Artcast is a streaming service available on Roku Boxes/Streaming Sticks, Apple TV, and Google Play Smart TV platforms. Also, there is select Artcast content available to Netflix subscribers (details outlined later in this article). There are two versions: Lite (free) and Premium (requires a paid subscription — details at the end of this article). Artcast Lite features about 160 Galleries, while the paid-version features 400 galleries, and a total of 20,000 paintings, photos, and videos. New Galleries are added weekly. One great feature of Artcast (both Lite and Paid versions) is that all the galleries are auto-looped, so, once started, you don't have to come back later and restart playback. However, if you decide to select another gallery to display, on the free version, you have to wait for another set of commercials to play. Each photo or painting displays for 60 seconds. The Apple TV version allows you to add background music. It is important to point out the reason that Artcast Lite is free is because when you select a gallery to play, before it plays, you have wait for a series of "TV commercials" to play — which can number anywhere from 4 to 6. The number of galleries included in each category varies. Using a Roku Streaming Stick to check out Artcast Lite, the paintings and still photographs looked excellent on a Samsung UN40KU6300 4K UHD TV. The example shown in the above photo is Vincent Van Gogh's "Fishing In Spring". The image is supplied in 1080p resolution (if your internet speed supports it), but the Samsung TV performed 4K video upscaling. In other words, the images you see on the TV in this article are 1080p source images upscaled to 4K. However, one of the important things to point out is that on Artcast Lite, when playing back video galleries — the video is susceptible to macroblocking/pixelation issues. On the other hand, the photos and paintings look great! Each gallery is about 40-to-50 minutes long. For still image galleries, each painting or photo displays on the screen for about 60 seconds before moving on to the next image. Also, using the Roku's remote control, you can fast forward or reverse to any point of on each gallery. In addition, if you walk away and just let your chosen Painting or Photo gallery run, it will auto-loop (video galleries do not auto-loop in Artcast Lite). According to Artcast, much of their image library is in 4K. However, only up to 1080p resolution via streaming is provided as of 2016, but 4K is in the works. Also, except for some of the video galleries, there is no background music soundtrack provided. However, Apple TV boxes allow users to combine music from their iTunes library with the display of painting and photographs. Music options for other platforms are forthcoming. Shown in this page is an example of a photo displayed via Artcast. Artcast includes travel, wildlife, and even vintage B&W photos in its gallery library as well. The particular photo shown above is one in their collection of Thailand travel photos. Artcast provides a convenient way to display art (currently up to 1080p) in your home without the expense of purchasing it. The art and photo displays can provide a great backdrop to special occasions — there are even galleries devoted to setting the mood for specific holidays. You can also use Artcast as a prelude to a "movie night" as your family or guests get settled into their chairs. Your TV can look good even when not being used for watching TV or movie content. All Artwork, Photos, and Videos are formatted to the 16x9 Aspect Ratio. Although this means that all the images fill the entire TV screen, the reason this is an issue is that not all artwork (especially classic portrait art) was created in that aspect ratio. An example of this is the image of Da Vinci's Mona Lisa, which is shown here. As you will notice, there are areas above and below Mona Lisa's face and shoulders that have been cut off (including the hands folded on her lap) in order to fit the painting in the TVs 16x9 aspect ratio screen. Artcast Lite is free, but you have to put up with a series of commercials before each gallery starts, and if you manually restart the gallery, the commercials with play again. Also, if you move from gallery to gallery, new commercials will play for each gallery will start. On Artcast Lite, the quality of the video galleries is inconsistent with video artifact issues (mentioned previously). However, on the Premium version, the video galleries look fine. Artcast adds to your entertainment experience, but there is more to consider. Artcast provides an interesting option to integrate artwork (both paintings and photos) into a home theater setting. Although Artcast is promoted for TVs, if you connect a Roku Box or Streaming Stick to a video projector, you can have an even bigger screen art gallery viewing experience. However, although TVs can be left running 24 hours a day, don't run down your video projector lamp life trying to do the same thing. Reserve Artcast video projector use for special occasions. Artcast Lite is a great way to sample the service, but stick to the painting and photo galleries, and take a pass on the video galleries. The Premium version of Artcast delivers the best experience. You can cancel at a later time if it does not suit your needs. Roku: Offers both the Lite and Premium version. The premium version is $2.99 per month. Apple TV: Offers both the Lite and Premium (Gallery Pass) versions. The Gallery Pass is $4.99 per month. Google Play: Offers only Premium version for $2.99 per month. Netflix: Stream Select Artcast Still Image and Video Galleries on Netflix are available to view in 4K, including Jellies (Jellyfish), Ocean Wonders, and International Street Art. To access the Artcast galleries in Netflix, sign into your account (or create one; monthly subscription required) and type in the above titles in the search. If you have a 4K Ultra HD Smart TV, you can also go into the Netflix search box and type "4K" and see them listed there as well. If you don't have an Ultra HD TV, the still images and video will default to 1080p or lower, depending on your available broadband speed. Although 4K provides the best visual experience, the galleries still look great in 1080p. All Artcast-provided galleries come with a background music soundtrack.